I don’t know about all of you, but you’ll probably tell from a few of my previous reviews, I’ve got a bit of an obsession with home scents. I love nothing more than relaxing in the bedroom with a few scented candles burning. 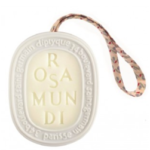 Or, chilling out in the bath surrounded by luxurious scents. It’s like therapy! So, although I’m not usually given to impulse buying, you can imagine that I was a bit excited to try the Fluffy Towels Candle from Yankee Candle even though I’m trying to make some lifestyle changes that will save me money I thought one treat wouldn’t hurt (what?). We all know how indulgent and cosy freshly washed towels are, so I was really hoping that this candle would recreate that level of comfort and relaxation. It didn’t disappoint. This is definitely one of my favourite home accessories at the moment, so let me tell you a little bit more about it. Firstly, let’s deal with the obvious bugbear most people have – the price! 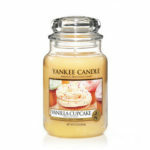 Yankee Candle is undoubtedly the world’s best loved scented candle manufacturer. However, a lot of people are put off by the price. You can expect to pay around £24 for a large candle, although there are some special offers if you look around online. Yes, this is more expensive than other candles, but you get what you pay for in my opinion! Yankee Candle promise up to 150 hours of fragrance with their large candles; I’ve not quite got this far, and to be honest I can’t see myself keeping a spreadsheet of the time spent burning candles, but it is clear that you will get much more use out of this candle than standard alternatives. 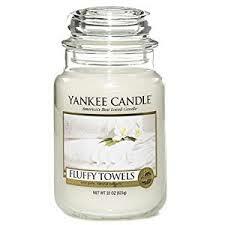 I wouldn’t say Fluffy Towels is a good choice if you are looking for a strong scent; it is more mild. When I first smelt it, I’d say I was actually a bit disappointed. But, after burning the candle for a while, the mild, fresh and comfortable smell started to gradually descend over the room, delivering the relaxation you’d expect. The candles reflects a warm, relaxed style, making a house feel like a home, with gorgeous notes of lily, lavender, apple and lemon. It really is soothing and creates a serene environment. Once you have had any type of Yankee Candle, one thing you will notice is the sheer difference in quality when compared with other candles. I never thought the quality of a candle mattered so much. As long as it’s easy to light and smells nice, surely they are all the same? Well, Yankee Candle makes you realise that they are not. You get a clean and consistent burn from the premium-grade paraffin wax, and the scents come from luxurious natural oils. You can see the difference. The wicks are even hand straightened to make sure they are centred for the best possible burn. I mean, if that is not attention to detail, I don’t know what is. So, if you are looking for a candle that is going to blow your socks off, this probably isn’t it! But, if you want something relaxing, soothing and comforting, then I would highly recommend the Yankee Candle Fluffy Towels Candle. Yankee Candles – Worth their weight in wax?